"The Country I Saw," or "How We Learned to Stop Worrying and Love North Korea’s Bomb (Almost)"
Wonkish hearts are aflutter over a new movie produced by the DPRK’s official film studio, Chosun Art Film Studio. The movie—actually four full-length sequels to a 1988 propaganda piece called The Country I Saw—is the fictional story of how one unassuming Japanese professor of international relations learns to stop worrying and love North Korea’s bomb. The Country I Saw Parts 2-5 are fascinating for another reason—they present a North Korean view of how they believe their actions are interpreted by both their enemies, as well as what might be called “objective” observers. The story centers on a Japanese professor of international relations, Professor Aiko Kayama, who teaches in Tokyo. In an interview with the Chosun Sinbo, writer Choi Il Sim explains that “the plot develops from a Japanese person’s perspective in a Japanese setting to enable the domestic viewers to look again at the series of international events surrounding North Korea from an ‘objective point of view’ so that our viewers can realize themselves, without any explanation or objectives, that the our nation’s path is justifiable.” As a result, the film helps reveal how North Koreans understand their pursuit of nuclear weapons and ballistic missiles. Scenes set in Professor Aiko’s classroom, as well as “briefings” in Japan, offer ample opportunity for heavy-handed exposition. This is not a subtle film. Japanese officials are usually depicted in various briefing rooms or command centers expressing shock at the capabilities of North Korea and irritation at their subordinate status to the United States. These scenes are full of revealing little details. For example, if you look closely at the wall map of Northeast Asia in the Japanese “command center,” you may notice something missing. Something LIKE ALL OF SOUTH KOREA. That’s right, someone took a pair of scissors to the wall map, removing South Korea and pasting Japan off the “coast” of the 38th parallel. South Korea, which is barely mentioned in the movie, is cut out literally and figuratively. Aiko: The current global politics transcends theories and ideologies and is now based on physical power such as missiles and nuclear. The premise of the nuclear-based politics is that there can be no war among nuclear states. Therefore, nuclear weapons can only be used on the non-nuclear states. Quite strange, isn’t it? Student: Professor, what should we make of North Korea’s nuclear weapons? Aiko: Well, I think it’s fair to say that North Korea’s nuclear weapons were a gift from the U.S. The only way for the U.S. to strike North Korea which withdrew from the NPT was to threaten with this strange weapon called nuclear. Do you think North Korea would let the U.S. to freely use nuclear weapons? If a group of bare-handed people were to go up to an armed robber and tell him to put the gun down, no robber in his right mind would listen. It is far more wise that the people get armed as well and convince the robber that they put the gun down together. Now let’s take a look at the slides. This is the Nuclear Posture Review by the Bush Administration. [note: The screen actually shows the 2002 National Security Strategy.] As you can see, the first on the target list is the Democratic People’s Republic of Korea. As exposed to the U.S. nuclear pre-emptive strategy, North Korea had to look for measures to secure its regime and survival which was nuclear armament North Korea took a very active retaliatory step which was asking the U.S. to decide whether to pursue peaceful co-existence with North Korea or to allow North Korea to become a nuclear state. North Korea actively retaliated by asking the U.S. to choose either peaceful co-existence or letting North Korea to get armed with nuclear. The U.S. answer was not to co-exist in peace, but to declare North Korea an outpost of tyranny and publically use violent language that it will not rule out using force on North Korea if necessary. The U.S. has also incorporated its stance that it will never co-exist with North Korea into policy through the second inaugural and State of the Union speeches by G.W. Bush and the confirmation hearing of the Secretary of State. North Korea, then, announced in February 2005 that they had built nuclear weapons for self-defense against the U.S.-schemed isolation of North Korea. This has prompted the U.S. which swore off the dialogue with North Korea to propose the Six-Party Talks first. However, the U.S., after consulting on the Joint Statement, recklessly trampled on the spirit of the Joint Statement and imposed sanctions and blockade on North Korea. After the missile test on July 5th, the day after the U.S. Independence day as well as President Bush’s birthday, [note: Bush’s birthday is actually July 6.] North Korea demanded the U.S. to decide between confrontation and dialogue. The U.S. answered with the passing of the UNSCR and increased sanctions. However, North Korea effectively retaliated by first, announcing the plan for the nuclear test on October 3rd, 2006 and then, successfully conducting the test on the 9th. This has made North Korea the first great nation that stood up for oneself against the U.S.
Student: DPRK announced to the world that the test will be conducted within 10 days from October 3rd. How come Japan and the U.S. didn’t know? Aiko: If you have a little understanding of North Korea, it is not difficult to estimate the test will be carried out on October 10th, the anniversary of the founding of the ruling communist Korean Workers Party. Not only that, since North Korea’s territory isn’t large, it isn’t an impossible task to detect the test site with the proper aerial surveillance system. However, because the U.S. has always underestimated North Korea, they failed to predict whether or not North Korea would conduct the nuclear test. Just like the test in July, the U.S. fell under the North Korean enticement and confusion tactics again. As the saying goes, they barked up the wrong tree once more. The students laugh riotously. A Japanese diplomat, named Shigenori, becomes so angry he runs out of the room. 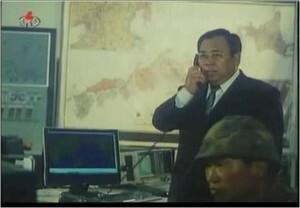 In the movie, it is North Korea’s nuclear test that forces the United States to engage with the DPRK. The film shows KCNA announcing the second nuclear test, followed by a Japanese report stating that the United States had no other option after the successful nuclear test but to return to Six Party Talks with North Korea. A pro-U.S. Japanese politician actually suffers a stroke when he hears the news, becoming paralyzed from the waist down and unable to speak. Impotent and mute! Did we mention this is not a subtle film? 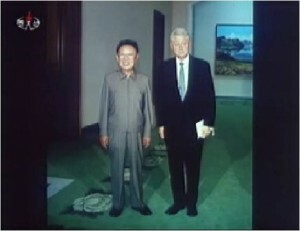 The film then cuts to a clip from KCNA showing a different Bill—former President Bill Clinton. Presumably, strokes are occurring throughout the Japanese bureaucracy. This is the big reveal—North Korea’s nuclear test has forced the United States to send a personage no less august than Bubba himself to North Korea. (Lock up the traffic wardens!) The movie ends with triumphant music blaring images of Clinton meeting with Kim Jong Il. So, what does The Country I Saw tell us, if anything, about the future of US-DPRK relations? One of the enduring questions has been what the DPRK really seeks from the United States. Most experienced voices believe that the leadership of the DPRK is seeking recognition for its regime, ultimately in the form of normalized relations. High-level contacts, such as summits and special envoys, are important evidence for North Korea that the world accepts the regime. The Country I Saw does much to reinforce the general view of a DPRK leadership that has set securing the legitimacy and stability of its regime as the over-riding foreign policy goal. That a visit by Bill Clinton instead of Bill Richardson is the big reveal at the end of the movie says a lot about North Korea sees its nuclear diplomacy. The movie is rather less encouraging on the subject of whether North Korea will negotiate away its nuclear weapons and ballistic missiles. Particularly notable is the observation that ideological conflict no longer dominates international politics. North Korea’s place in the world, at least in The Country I Saw, is entirely a function of missile and nuclear capabilities. The United States may be able to achieve temporary reduction in tensions and even freeze certain programs, but it seems equally clear that the DPRK has concluded that its survival as a functioning state in the international system is entirely a product of its military capabilities. Soft power is not concept that gets much attention in The Country I Saw. “Leap Day Deal,” US negotiators believed for much too long that North Korea might be persuaded to the forgo the rocket launch to celebrate the centenary of Kim Il Sung’s birth. The Country I Saw makes clear why that would be unthinkable for North Korea’s leaders. The Country I Saw contains scene after heavy-handed scene reinforcing the notion that Kim Il Sung’s regime is exceptional as the one country able to survive the unrelenting hostility of a predatory United States through its hard power. Just as the rocket launch was a symbolic expression of this connection, suspending the launch under foreign pressure would reveal the fundamental bankruptcy of Kim’s legacy. That would be the political equivalent of the stroke that leaves the victim paralyzed from the waste down and unable to speak. Kim Il Sung may be dead, but in North Korea that doesn’t he is impotent or mute. In North Korea, after all, he is still President. Jeffrey Lewis is Director of the East Asia Nonproliferation Program at the James Martin Center for Nonproliferation Studies, Monterey Institute of International Studies. Hanah Rhee is a Graduate Research Assistant at the Monterey Institute. Shigenori, initially a hard-liner, comes to admire the DPRK over the course of the film and is martyred for his trouble.